A pool for laps or open water. A long distance treadmill or safe area to run outside. Now these items, of course, are for the triathlete. But what about the family? Isn’t the most important point of a vacation the happiness of the whole family? Traveling with a triathlete can become overwhelming and having to meet their training needs when the whole family just wants to have fun can be challenging. All this means that finding the perfect destination can be tough, but is a necessity. And don’t forget that there must be food that will not ruin the training diet. Mont Tremblant is our number one “go to” place for all families, whether you are with kids or without. It truly is the ultimate training destination and full of fun. From hiking to spas to water skiing to zip lining, you can do it all or nothing at all. We especially love that the mountain always has something happening like the Jazz Festival, Food and Wine, and so much more. There are also fabulous kids’ clubs and activities so that you can have some adult time, too. When looking for the perfect place to stay, your options are many in Mont Tremblant. From romantic rooms with fireplaces to condos with kitchens to home rentals, your family will be very comfortable. We highly suggest staying on the mountain in the Village. Older kids can explore and all the activities are right there. You truly do not need a car. On the mountain, you will also find any type of food you want, including a grocery store if you choose a place with a kitchen. For all the details, check out our Mont Tremblant recommendations. Swim – There is nothing better than an open water swim. From either the beach on the mountainside or the beach club, you can rent a kayak and head on out to spot your triathlete for an open water swim. It is an easy area to swim in and is the actual course of the race. It’s also fun for out and backs. Bike – Mont Tremblant is full of gyms with bikes to ride indoors, but you will want to get out and ride the actual course. The area is used to bikers and very rider-friendly. Run – This is another easy training to check off each day. With both the actual race course and accessible trails, you can train without even thinking about it. There is a good chance you will catch a running group to join as well. Located on the Gulf Coast of Florida, Sarasota is perfect year round for vacationing and training. The area is full of so much to do for everyone in the family and located short drives from so much more. Sarasota has the MOTE Aquarium, Bird Rescue Center, the Zoo, and the Ringling Museum, Home and Gallery. If you have an active family you can be on the water 24/7 or just hang out at the beach. And in case you didn’t know, Sarasota has some of the most beautiful beaches in the world. Sarasota is bursting with new restaurants and old gems that are treasured by the locals. You must be sure to visit the Farmer’s Market in the downtown area. It is one of the best we have seen around the world. Sarasota also has a variety of hotels and resorts that rival any area. You have it all from small boutiques and trendy hotels to beach resorts and the traditional Hiltons and Ritz. For all the details, check out our Sarasota recommendations. Swim – There are both great options for open water swims and pool training. There are olympic distance pools in the area you can buy a day pass for and some also include water park areas where the kids can have fun as well. For open water swims, we suggest you either join a group swim easily found through a local triathlon club or that you have a buddy rent a kayak and spot you. Bike – Most of the larger hotels and resorts have both stationary bikes and spin bikes to train on. If you are in the mood to get outside, Sarasota is a bike-friendly town. Run – There are a ton of options for running in Sarasota. You can get on the beach and run a great out and back. There are trails in the area that include parks, wetlands, and pure beauty with run paths throughout the area. Many find that there is no more magical place for a family getaway than Walt Disney World. And many write it off as lost days of unhealthy eating, no training, and breakdowns. The truth is, when done right, it can be relaxing, fun, healthy, and you can even get in your triathlon training. Location is key to making the trip worth it. We suggest one of two options; either rent a local home or stay on Disney property. There are many rental communities where you can get a full home with a kitchen and pool to make as your home base. These communities have gyms and it is easy to access Disney with a rental car. We believe that staying on property though is better overall. There are a variety of property types both for budget and size. We prefer properties located by Epcot or on the Monarail to make getting around a breeze. Eating well is also easy given that Disney has made many changes in the past few years to introduce new menus and quick service options that will meet any diet. For everything Disney, an amazing resource is TravelingMom. Swim – Although the resort pools make laps impossible, the World of Sports has a pool available during certain times to get your swim in. The Orlando area is also full of local pools and clubs that you can pay a day fee to get in your laps. Bike – Biking is the one thing that is a bit harder at Disney. With the enormous amount of traffic, we do not suggest riding in the Disney area. Instead, we suggest that you stick to an indoor ride in one of the gyms or try and get out of the park. Run – Disney is known for its half and full marathon races. They are a bit of a cult among certain groups. Traveling around the world to do all the races is a challenge many take on. But if you are just looking to get a training run in, stop by the desk of your resort and they will supply you with run maps that are available around most properties. We cannot say enough about the food, fun, and training when on vacation in Kona. 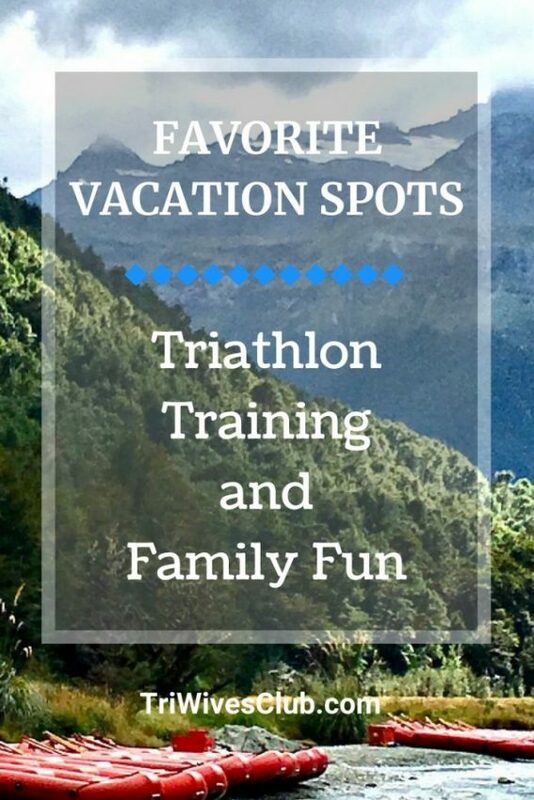 It is the ultimate vacation destination for triathlon families and the ultimate triathlete dream. We have been multiple times and have vacationed in the area for literally years. Plus, we have many friends who live on the island so always get the local favorites. Kona has it all from the classic Queen K to multiple resorts such as the Four Seasons and the Mauna Kea. Plus, there are plenty of rental homes and condos if you want to go that way which we often do. Although the food is local and delicious, we also highly suggest the farmer’s market to buy as much as you will use especially if you have access to a kitchen. For all the details, we have written tons on Kona. Swim – This is easy- OPEN WATER! If you do need to do drills, there are local pools you can buy day passes for. Bike – Although many resorts have spin classes, there is nothing better than getting on the road and riding. Given the number of races held here and terrain, Kona is extremely biker-friendly. Run – Again – hit the pavement and make sure you hit the Energy Lab! We realize not everyone can get to New Zealand for a vacation, but if you can, all we can say is GO! New Zealand was always #1 on my bucket list and I recently got to check it off. The whole country is very outdoors oriented, but one area that has triathlon training written all over it is the Queenstown/Lake Wanaka area on South Island. Both areas, less than an hour apart, are home to a vibrant mix of restaurants, cafes, shops and plenty of areas to relax and enjoy the amazing scenery. They’re fun and stunningly beautiful places with loads to explore and keep you busy. The family will be SO happy! Plus, these picturesque resort towns have plenty of accommodations for all budgets. But, just be aware that you have to allow plenty of time for this vacation as it’s far and who knows when you’ll get back. There is just so much to you have to explore beyond this area and you have to take advantage. For all the details, check out our New Zealand pieces for the triathlete and for vacation. With endless mountains, trails and lakes, it can only mean that this area is made for triathlon training . Challenge Wanaka takes place in February and features one of the world’s toughest courses set against a stunning alpine backdrop. It is renowned as one of the world’s most scenic iron distance triathlons and I’m venturing to guess it really is. Of course, this means that your swim, bike, and run all need to take place outside. I will also guess that you might get the family to participate in one or all, too. What is your favorite vacation spots for triathlon training?